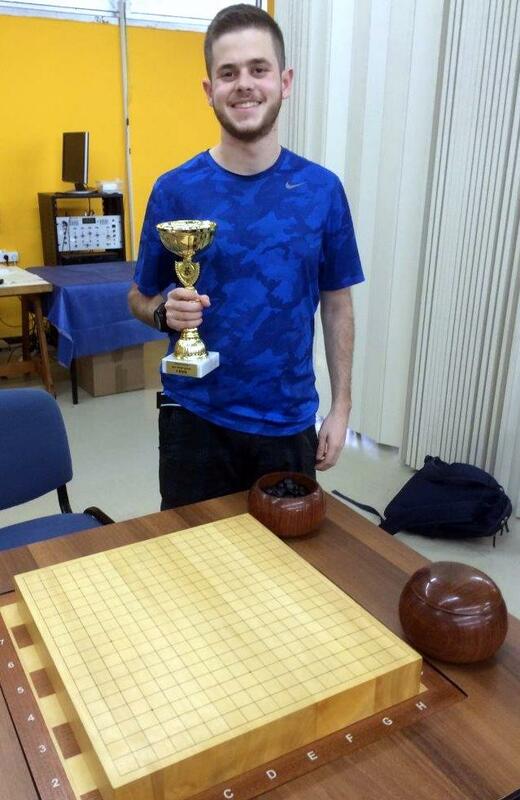 The 19th Israeli Go Championship took place in a quiet residence area in Ramat Gan, Israel. During an extended weekend October 15-17, the 6- round tournament brought strong and young players from all over the country. 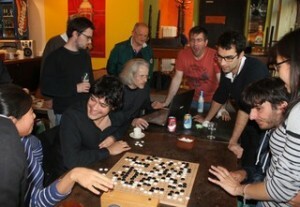 The calm atmosphere outside was in great contrast to the fierce fights on the board. Amir Fragman 5D (right) defeated defending champion Jonathan Lidor and a veteran champion Leonid Entin with five straight wins to secure the title. Second was Ofer Zivony and third Reem Ben-David. Half the participants were dan level players. Click here for full results and more photos. This Sunday, October 18th starts the fourth year of the Pandanet AGA City League. Make sure to follow your local and favorite teams throughout the year. We’ve already had one game early this week and it was exciting to start off the year. For those who have followed in the past we have expanded the leagues and there are now eight teams for the A and B leagues. Also starting this year is video reviews from online commentators like Hajin Lee and Andrew Jackson. 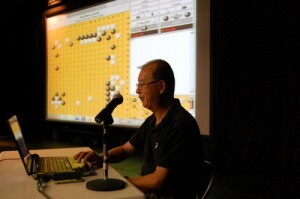 The first round will be commented by Xiaocheng-Stephen Hu/xhu98. Worried you’re going to miss football while watching the games? Download the Android and iOS app for Pandanet. Look in the AGA City League and AGA City League (Manual) rooms. This year, the French Pair Go Championship took place in Strasbourg on the weekend of the 10th and 11th of October. Fourteen pairs were present. Would the pair of Nyoshi Cao and Antoine Fenech, reigning national champions for the past two years, be able to add to their tally? Many pairs were hoping to claim their title: Monique Berreby and Olivier Clergue, Marie-Claire Chaine and Farid Ben Malek, and Zhao Pei and Baptiste Noir. After a fierce competition, Cao-Fenech met Pei-Noir in the grand final (right). After a difficult opening, Nyoshi and Antoine headed into a thunderous endgame and ate a big group to clinch as 3-time champions. In second place, there was a tie between Zhao Pei-Baptiste Noir, Laura Lebastard-Jérôme Salignon and Charlotte Vielfaure-Thomas Debarre. This year, Dominique Cornuejols and Denis Karadaban will represent France at the International Amateur Pair Go Championship. Over 90 players have already pre-registered for this year’s Cotsen Open, coming up October 24-25 at the LA Center Studios in Los Angeles, CA. 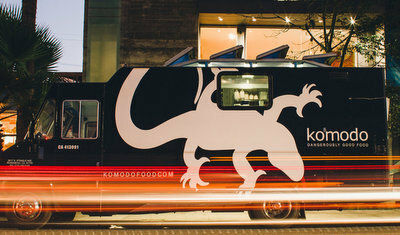 The popular tournament features a free food truck lunch on both days: Komodo Food on Saturday and Kogi BBQ on Sunday. The $20 entry fee is refunded if you play in all five rounds. With the October 20 deadline approaching, over 65 players have already pre-registered for this year’s Cotsen Open, October 24-25 at the LA Center Studios (note new location). In addition to one of the largest and strongest fields on the West Coast, the tournament features free food truck lunch on both days, a full refund of the $20 entry fee if you play in all five rounds and the hallmark of the Cotsen, free massages for all players. Davis adds. Yilun Yang 7P will play a match against Qun Wang 8P on Sunday morning, followed by an analysis of the game. Kiseido/Yutopian will have a vendor table on the Saturday of the event. As an added bonus, “We will be printing new ‘Cotsen Open’ branded products, including never before seen playmat travel go boards with original art,” reports Tournament Organizer Samantha Davis. East Coast go players — especially those in the Boston area — are counting down the hours to this weekend’s first American Chang Qi tournament. The tournament is being held September 26-27 in conjunction with the semi-finals of the 2015 Chang Qi Cup, at which four top pros from China will compete for a berth in the Chang Qi Cup finals. The weekend promises a go bonanza for both players and observers, who will be able to compete in the amateur tournament as well as watch the pro games; for those who can’t make it in-person, there will be full coverage of the entire weekend’s events on the AGA’s live broadcast channel (starting at 9a EST on Saturday), on KGS and in the E-Journal. Online registration (free) is continuing, but there will be on-site registration from 8:30 to 9:30 on Saturday. Visit the ACGA’s website for more details. 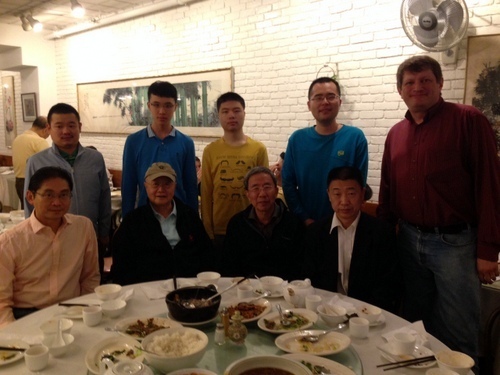 Photo: Chinese Chang Qi delegation at dinner at the Yenming restaurant near Harvard Square Thursday night. Standing (l-r): Qiu Jun, Lian Xiao, Li Qin Cheng, Tuo Jia Xi (click here for their profiles) and AGA President Andy Okun. Seated (l-r): Shao Weigang 9p, Ying Ming-haw, son of the founder of the Ing Foundation, Hua Yigang 8p, former president of China Qiyuan, currently VP of Chinese Weiqi Association and Wang Yi 5p, captain of the Chinese National Weiqi team. 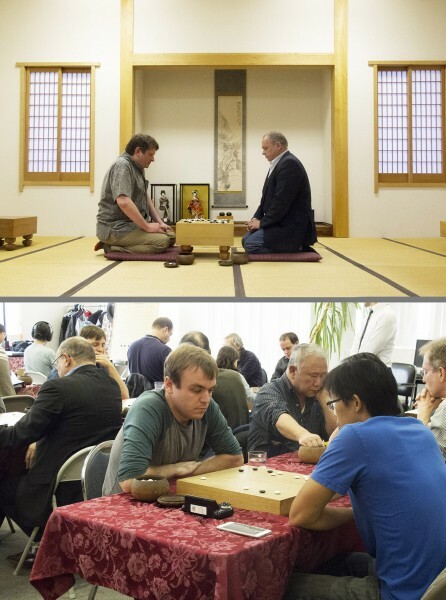 The 2nd World Students Pair Go Championship is coming up in December, and the United States is searching for a male and female representative through a pair go qualifying tournament. The online pair go qualifying tournament will be held this weekend with a possible extension to Monday if needed. The winners of the qualifiers will get 50 percent of the round-trip airfare cost, and the meals will be covered from Friday evening to Tuesday morning. The championship will be held in Tokyo, Japan from December 4th to the 8th, and this will be a 4-round Swiss system with a 45 minute sudden death time limit. Interested players should email cherry.shen@usgo.org with their names and best method of contact as soon as possible as we need to select a representative by October 1st. Please email even if you don’t have an immediate partner. - Austin Freeman. Photo from World Amatelur Pair Go Website. The selection process for the 2016 World Mind Sports Games (WMSG) will begin at the upcoming American Chang Qi Cup in Cambridge, MA, on September 26 – 28, says AGA President Andy Okun. Although plans have not been formally announced, it is expected that the 2016 WMSG will be held in Macau, China. Prior WMSG competitions (2008 in Beijing, and 2012 in Lille France) invited large teams for both women and men. “That means that some players will have a chance to make the team with lower ratings than usual for our international events,” said Okun. “The existing qualification points system is being modified to include the lower ranks, and will be used for selection of both the men’s and women’s teams.” Other tournaments intended to be used as qualifiers include the Cotsen in Los Angeles, the New Jersey Open, The Maryland Open and at least two online tournaments; other tournaments that meet certain criteria may also be designated as qualifiers. The points system will also select for invitations to the North American Masters and may be used for other invitations that come up from time to time, Okun said. Registration is speeding up as the Chang Qi Cup approaches. At this point, less than two weeks remain before the Cup kicks off at Harvard University. The unprecedented event will include professional commentary on the Chinese semifinals, an amateur tournament with more than $10,000 in total cash prizes, and multiple other special events. There will be a lot of professional go players on hand: Chang Hao 9P, Yu Bin 9P, Mingming Yin 1P, Andy Liu 1P, Gansheng Shi 1P, Calvin Sun 1P, and Ryan Li 1P have all confirmed they’ll be in attendance. Because there are less than two weeks left, organizers highly recommend that anyone who wants to make travel plans do so soon. Information about hotels and transportation, as well as general information and registration, is all available on the ACGA’s website. -Julian Erville. Photo: Student Organization Center at Hilles, Harvard University.